If you choose the title of this post as a title for one of your creatively written poems, you are a creature of overwhelming passion. F. Sionil Jose, national artist for literature, is that person. He is one of the most widely-read Filipino writers in the English language. His works gracefully exude the social issue of class conflicts and colonialism in the Filipino society. He founded the Philippine branch of PEN , an international organization for writers. His famous work is a five-novel series called "The Rosales Saga" which painted a picture of the Philippines by covering three centuries of its history. This compelling saga was translated into twenty-two languages. He was hailed as Philippine National Artist for Literature in 2001. Freeway featured some of his well known works as interpreted in a pocket collection which includes staple favorites graphic tees in trendy silhouettes, modern tailored woven tops and dresses and accessories. The brand is very much excited to feature its first living National Artist. I've been witness to the first four featured national artists but the event more than a month ago was the first one I went to where the artist featured is still alive. It's like he jumped out of one of his books still holding a pen ready to write as soon as he acknowledges an inspiration. To view the entire collection, visit the Freeway Website or visit the Freeway Facebook Page. And oh, last month Freeway asked Facebook fans to choose their favorite item in the collection. I chose Aphrodisiac's and Affairs, a woven sweetheart neckline dress in colorblock print. I posted the picture of the dress and these words: "I want this Freeway Online x F. Sionil Jose dress/shirt/top because this masterpiece will be a perfect addition to my wardrobe. I will be walking like a page straight out of of F. Sionil Jose's book of poetry. 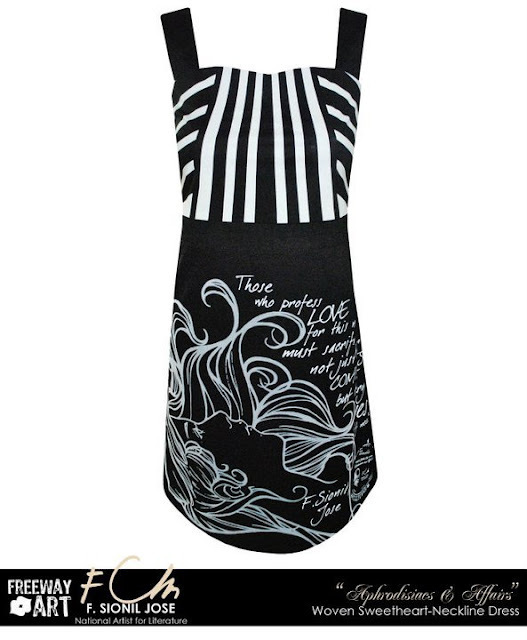 The dress is a noir canvas of the poetic genius of Aphrodisiac's and Affairs by the National Artist for Literature. I particularly like the words written over this woven sweetheart neckline dress in colorblock print, it touches one's feelings and evokes a myriad of emotions."